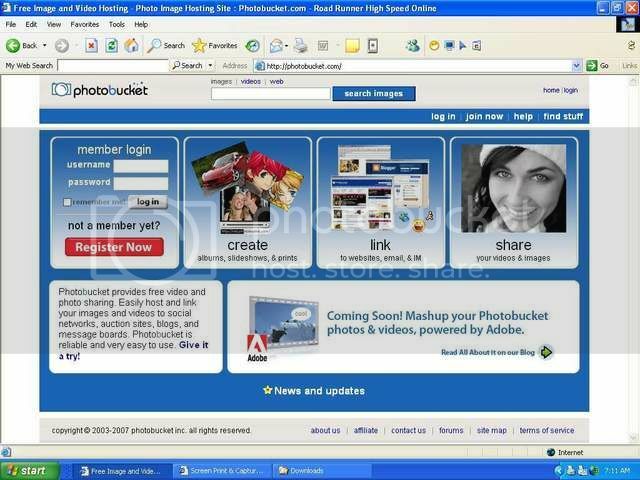 There are many websites you can use to host pics. 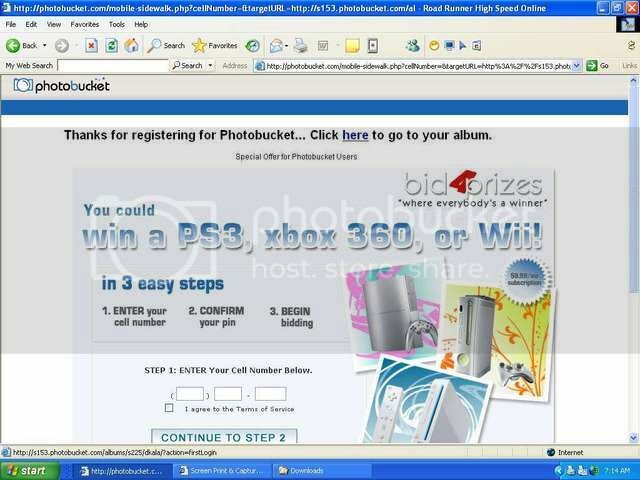 Photobucket is very easy to use and free so that is what we will use for this demo. 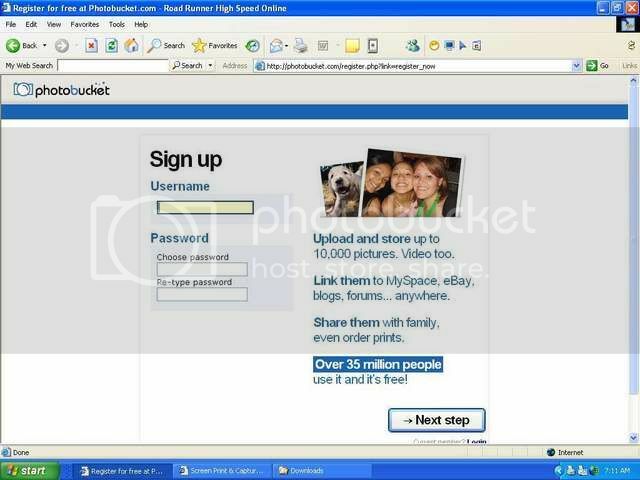 The first thing you need to do is go to the Photobucket website. Now select a user name and password and the click "Next step"
Fill in the rest of your personal information and click "I accept. Sign me up"
The next screen is one of those promotional things. You can skip that by just clicking up top where is says "click here to go to your album"
Now you are at your album page. 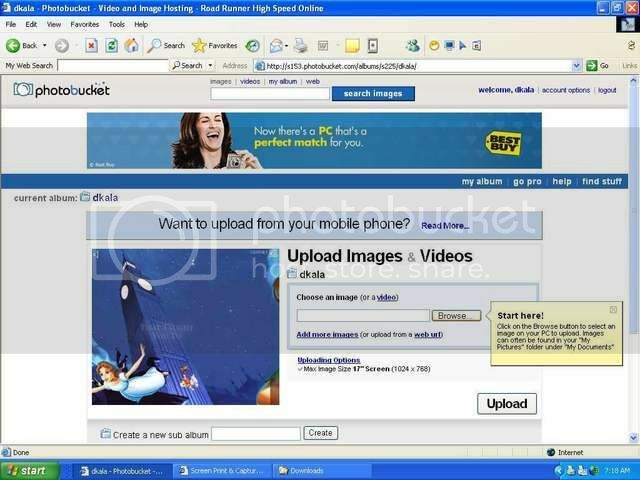 On this page you can upload images to your album or view the photos in you album by scrolling down on the page. To add pics to your album select the "Browse" button. Or if you want to add multiple pics to your album at once select "Add more images"
This will bring up a Windows Explorer screen where you need to locate the picture you want to upload. After the image loads just scroll down on the page and you will see a thumbnail version of the image in your album. You have many options on what you can do with the picture here but we will concentrate on posting it on the forum. The easiest way I have found to do this is open the Woods Buggy.com forum in another window. Now in your album click on the area under the picture that is highlighted in blue on the pic below. "IMG Code"
Now in the Woods Buggy forum you can either right-click and select paste or ctrl-v. That will post the image code for the pic you want. Just remember that if you selected "Preview" that you did not post that on the forum yet. If you are happy with your message and are ready to post it just scroll down on the page and select "Submit"
Hopefully this should help anyone who is having problems posting pics. If you are still having problems just let us know and Im sure we will try to help you. Hey man that was great! We have got to keep that. I have tried to explain the process to people but you have it going on. Also the buggy in your example pic. Thats wild. That pic. had to be taken at old 909. There was a wall down by the creek that looks just like that. There were some pretty crazy dudes riding down there years ago. I think your right about the 909. I've been up that wall at the play ground before.We use to ride there for years. Looks just like the creek at the playgrounds at Livingston, A.K.A Exit 49 or Cromer's Ridge. upload pic your size you want and paste in the message! That picture looks like it was one helluva ride. The guys name is Tommy, it crushed his top in about 8 inches, he was taken to the hospital by ambulance, sewed up and came back to ride some more. hey[IMG]http://i6.tinypic.com/6yaqrsh.jpg[/IMG] guys Im new too!here is a picture of my chaindrive! i think you have to have it put on a disc. 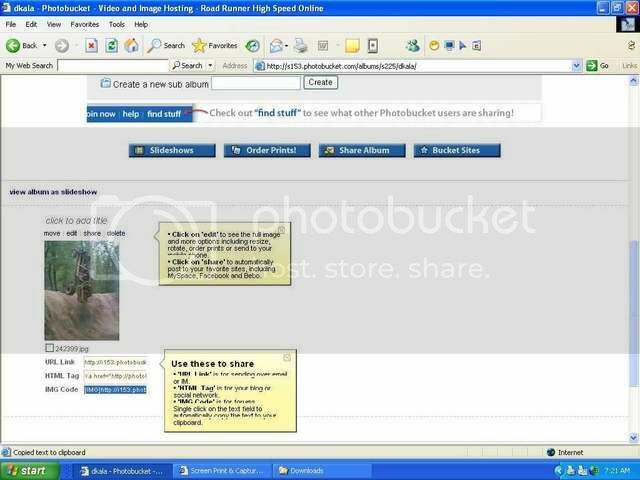 then down load it to photobucket. like i said i think not sure though. I don't know about an 8mm but maybe you can google it and find out. "It is better to trust in the LORD than to put confidence in man". Maybe you could take the 8mm to Walmart and have them put it on a DVD, if your computer will play DVD. 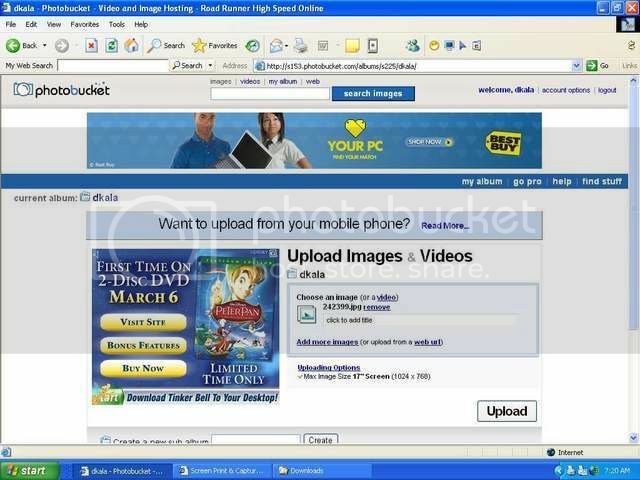 Save it in your computer, then you could upload it to photobucket or similiar video hosting website. Then wait about 10 minutes for every 30 seconds of footage for it to upload !! You could set the screen up and play the 8MM while you record with DVD camera on tripod zoom in on the screen. If it has A&V jacks you could buy a Dazzle and record straight to hard drive. Trying to get pic's up of my build. Turns out I already had a photo bucket account. So I've added photos to it, but can't figure how to post them here 'cause the're to big. I printed out this entire thread to try and figure it out, but I'm just computer stupid and don't know what to do. HELP! Yeah and I don't know how to swim either. 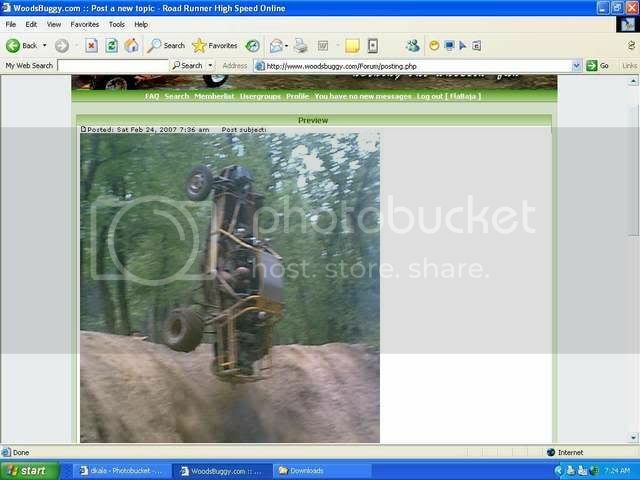 Dave W.
Could somebody tell me how to organize my pics in Photobucket so I can place my build in order as it was built? Bump, for those who still dont know. How do I make my picture smaller so I can use it for my avatar? I have used photo bucket, but can't get it small to post. Thanks for your help. So what is everyone using to upload pics now?